The October Foreign Service Journal focuses on our Foreign Service Specialists, who today make up almost half of the Foreign Service at the Department of State. Foreign Service Specialists are responsible for all the work of the Foreign Service outside the work of a traditional diplomat, from diplomatic security agents and IT experts to librarians and medical officers. Their ever-expanding duties have rarely been more important to the success of American foreign policy abroad. We examine specialists through three separate articles - an overview, a compilation of views from the field, and what specialists want you to know. Also in this issue, in Learning from Women’s Successes in Afghanistan, Sandya Das draws on women’s experiences in Afghanistan to discuss how sensitivity and technical skills are needed in insecure environments. Christopher Teal’s Flying Monkeys in the Embassy reflects humorously on the infiltration of Embassy Colombo’s fortified walls by a mischievous monkey. Diplomatic Security agent Tony Hornik-Tran reflects on his experience as a refugee and a diplomat and in this month’s FS Know-How column looks at the thorny issue of child custody in Foreign Service divorces. USAID Vice President Sharon Wayne, in her bi-monthly column, wonders about the human cost of longer tours in places like Afghanistan, Iraq and Pakistan and the impact of post-traumatic stress disorder. 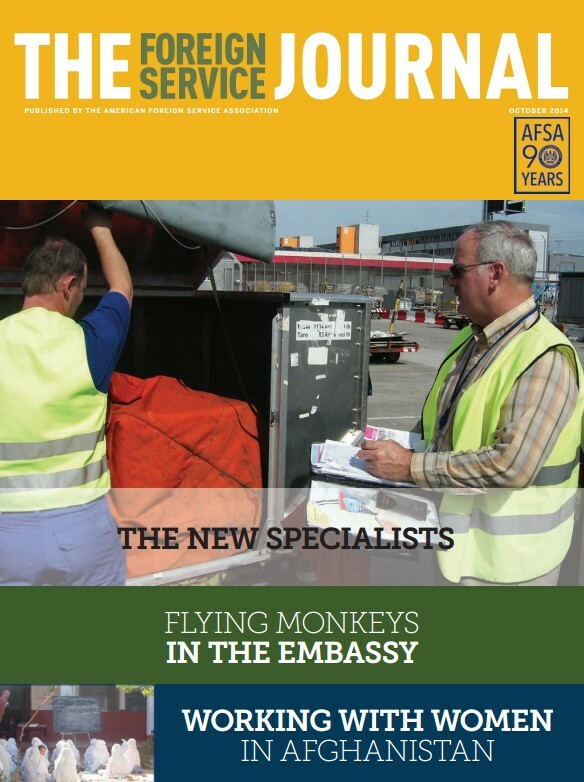 Elsewhere, AFSA President Bob Silverman shares two secrets of the Foreign Service. Here is a look at the wide world of Foreign Service Specialists. We explore who they are, the many critical things they do, and how their work has evolved with our changing times. BY W. PAUL MARGULIES JR. Sensitivity and technical know-how are at a premium when working in these fragile and insecure environments. For 24 hours, the most heavily fortified building in Colombo was compromised by a monkey.